Millie has been a very good girl in her first week with me. We've almost got the potty training sorted - imagine me in pink fluffy dressing-gown out in the garden by torchlight, at 3am in the pouring rain saying "potty wee-wee Millie, potty wee-wee!!" Yes, if I had known I would have thought twice!!! All my coat pockets now contain a few treats and a doggie-poo bag. Barbara the dog-sitting lady has turned out to be a star and stays twice as long as I pay her for. Millie still cries when I leave her alone - well - howls actually - but now it's only for about 90 minutes, instead of three hours, then she falls asleep. On Friday she went to the vet for her jab, and didn't bite him (result), and on Saturday she had her first bath!!! She looked like a little white rat when wet through - but loved the hair dryer! She's still bossing all the other dogs about down at the stables and gets very loud and yappy when they try to re-assert the status quo. She makes me laugh about two dozen times each day, and she only has to look at me and I can forgive her anything. She's growing very fast but I can just about still fit her in one hand. I can't believe that I waited 44 years to get a dog. I should have done it years ago. Our Vacuum cleaner doesn't work very well and after a frustrating half an hour trying to clean up today, I popped to Currys and bought a new Dyson. It's fantastic and my carpets look like new. Doesn't take a lot to keep me happy!!! Throughout my life I have met a few very special people. Only a few - but they more than make up in quality what they lack in numbers. The fact that there are only a few of them make them even more special. In 1991 I met a very special person who occupied a huge part of my life and my heart for two years. Time has passed, and we have both moved on, but the memories of the love that I shared with this person are kept in a special quiet corner of my heart. I saw this person again yesterday and it was fantastic to see him. He's very happy in his life now, as I am, and for that I am grateful. Even though relationships don't always work out, the good ones leave behind a footprint on your heart that stays with you always. These experiences and relationships are what shape who we are, and that time we had together was a very special magical time for me. As they say, 'It is better to have loved and lost, than never to have loved at all". This is Milly. I went all the way to Mid Wales on Thursday to fetch her from the breeder. 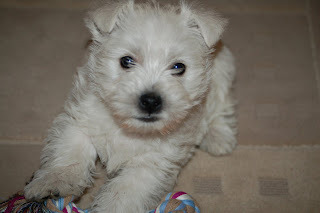 She's a West Highland White puppy and she's nine weeks old. Even though I do say so myself she's REALLY CUTE!! She's really well behaved and can sit when asked already. The toilet training is getting better every day. She's not a replacement for Danielle, Oh No... But she is my special friend. At the stables she bullies all the other dogs and won't let them anywhere near the dog bed which is in the kitchen! Her Kennel Club name is Lady Penelope Marguerita, and that's because I have named her after my Mum and her twin sister...I hope that she turns out to be every bit as much of a lady as they are. We start Puppy training classes next week. I'll let you know how it goes! !